Reik is a Latin Grammy-winning Mexican band from Mexicali, Baja California formed by Jesús Alberto Navarro Rosas (lead vocals), Julio Ramírez Eguía (guitar/background vocals), and Gilberto Marín Espinoza (guitar). 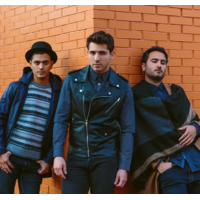 The group's name actually means "rake" (as in raking the guitar's strings), but the band wanted their Mexican listeners to pronounce it correctly, hence, Reik. In 2003, Abelardo Vazquez started their then-nascent musical project, tentatively called "Reik". Abelardo Vazzquez invite Jesús Navarro and Julio Ramirez to recorded their first demos, which were released through the Mexican underground club scene. Two of the most successful demos — "Levemente" and "Ahora Sin Ti" — brought more widespread coverage across Mexico. In early 2004, Reik invited Gilberto to join the band. They have been famous ever since, mainly in Latin America, Mexico, and southern parts of the United States. Their videos have been broadcast on famous music television channels, such as MTV and HTV. Their second album, Secuencia, was released on November 14, 2006, which featured the first single, "Invierno" (released on November 6), which gained a lot of popularity based Latin American airplay. In September 2008 Reik released their third studio album Un Día Más.